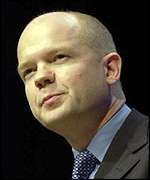 William Hague, accused of "Naked Racism" by Tony Benn. Photo thanks to BBC. It is very easy to paint the UK Conservatives as racists. Indeed, it has to be noted that they do rather lend themselves to it. A Guardian comments article today has a look back at Tory racism over the last year, highlighting case after case of Conservatives making terrible racist comments. I have blogged before about how the Tories sit with racist and homophobic partners in the European Parliament. Yet all of this needs some clarification. There is nothing inherently racist about voting (or at a push) being a member of the Conservative Party. The Tories, top brass present themselves to be as clean as a whistle, commenting that racism is a thing of the past for the Tories. Sadly, as the above mentioned article suggests, this is not the case. There appears to be a correlation between those active in the party and a certain level or racism. This is obviously not absolute (I know some very open and accepting Tory officials) but it does appear to set a rule of thumb. Elected Tories often have an entrenched form of racism at the basis of their politics. This has to be separated from the mass of Tory voters. I honestly believe that there are many Conservative voters who share similar feelings to me. I come from a long background of “blue”. Growing up in rural Gloucestershire in a middle-class family I have been exposed to all the highlights (and many lowlights) of a true blue up-bringing. I feel in many ways that I am a conservative at heart – I do not like things to change. I like drinking tea and going for walks. I find protests uncomfortable and noisy. When people advocate change you never know what’s going to happen. I like many traditional aspects of life and I want to irrationally hold on to them. Just because I like tea when served in fine china, it does not mean I am a racist. There is nothing inherent about liking the traditional aspects of life and being a racist. It follows however, that if you share these sentiments then you to have to consider whether a Tory vote really represents your values. Just because you like a quiet life, does that mean you can back a party dripping in racism? Despite Cameron’s PR game trying to paint them as the cuddly party, there is still a nasty side to them that personally means I could never support them. Despite what Cameron peddles about racism, it has been shown his party is endemically racist. Despite what Cameron would say about opposing the death penalty, many of his MEP’s voted against the EU position on the death penalty at the latest Strasbourg session. Despite what Cameron would say about equality we can see that his party is dominated by the Eton élite who get upset if asked to sit in standard class on the train! These guys do not represent the “levels of common decency” that are key to my moral make-up. These guys represent something that is alien to me, xenophobia, racism and a massive sense of homophobia. I am going to vote Green at the next election because they are there to preserve, to look after and care for many of the things that I care about (the countryside, my old age, the disadvantaged in society, the NHS, schooling etc). I cannot support the conservatives; yet let’s not start accusing every other conservative voter of being a racist; this simply is not the case.